A private family visitation will be held Monday at Calvert-Johnson & Froelich Memorial Home, Flanagan. Barry was born June 16, 1946 in Pontiac, IL the son of Selmer and Mary Louise Kutzner Highland. He married Barbara Scott February 14, 1981 in Pontiac, IL. She survives along with his mother Mary Louise Highland of Pontiac, three children Hope, Matthew, and Mark Highland all of Cornell; three grandchildren Kaydence McKenna, Marley Highland and Makaya Highland; one sister Lillian Saxton of Varna, and four brothers Dennis Highland and Gene (Sandy) Highland both of Pontiac, Ron Highland of Ransom, and Dave Highland of Streator. 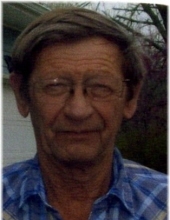 Barry was Lutheran and a lifelong farmer in the Cornell area. He enjoyed farming, cows, and his grand-kids. He was a friend to all and enjoyed helping others. "Email Address" would like to share the life celebration of Barry L. Highland. Click on the "link" to go to share a favorite memory or leave a condolence message for the family.